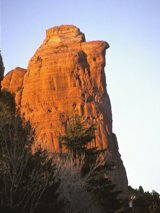 When we made our first visit to Sedona in 1986, we both felt it was one of the most enchanting places we had ever visited. 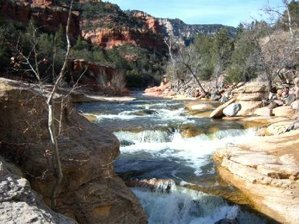 We loved the spectacular natural beauty of the area, and the overall energy was so serene and pleasant that we knew we wanted to live here. 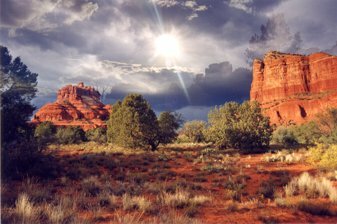 When we eventually made the move to Sedona in 1993, it proved to be everything we had hoped for, and more. 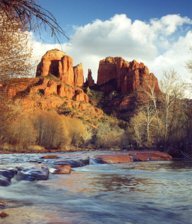 Sedona has provided us with an envirornment which has helped us grow, not only as a couple, but also as individuals so that we have been free to explore the possibilities life has offered us over the years. Micki is an artist and designer, and is the founder of Deva Designs. She operated the company for 20 years and did all of the design work for the Deva Designs products featured in retail stores throughout the world. Many of these products have won COVR awards for Product of the Year at The International New Age Trade Show held in Denver, CO each year. John did all of the website and graphics work for the company. In August 2010 Micki and John retired and turned the day-to-day operations of the business over to daughter-in-law Suzie and son Bob. Now we are free to do what we love best: spend time together, travel and enjoy our life. 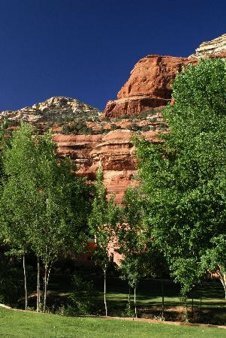 Even though we still help design new products for Deva Designs, we now have the time to truly enjoy Sedona and each other. As a couple we are extremely close and have been committed to personal growth for many years. We love to explore the subtle energies and other mysteries of life. Our greatest joy is providing information to help others learn and grow so that they can live their best possible life. For those interested in genealogy, here is an English translation of Dueholm Genealogy, a Danish book written in 1951 by A. P. Dueholm, John's grandfather. The book contains 350 years of genealogy for a number of Danish lineages from mid-Jutland. Understanding the Masculine and Feminine Side - Defining yin and yang, and the balance between them. Centering (Balancing) Your Emotions - A balancing exercise (a powerful way of drawing on the Universal Energy). Personal Growth - What it takes to make changes in your life, and how to pursue those changes. The Subtle Energy of Crystals and Stones - How crystals and stones interact with your personal energy and Inner Self. Stones for Personal Growith - How individual stones help strengthen particular energies or human qualities. 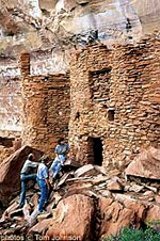 Includes separate articles for 32 stones and explains the energy that each stone strengthens. Quartz Crystal (the Master Stone) - The general energy characteristics of quartz. Quartz Crystals with Special Properties - Metaphysical properties of some specific types of quartz crystals. 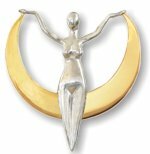 Using a Pendulum to Enhance Intuition - How to get answers by using a Pendulum. Wisdom for a New Age - Anonymous sayings to help us enter the Age of Aquarius. Affirmation - Anonymous sayings to help strengthen the Inner Being. The Tie That Binds - A poem by John Baumann. Links Page - Links to other New Age, Metaphysical, and Growth Oriented Sites.